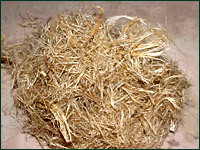 The kenaf fiber deriving from processing the bark of the kenaf plant is pale yellow in colour and is the most highly valued product coming out of our system. It has a degree of purity from woody debris and pectins equal to 99% and is highly appreciated in the construction of mats with thermoset natural fibres for the automotive industry and technical applications. Only 10% of the fibre, that is the longest and thinnest part, is used in the textile sector producing at first a yarn with a metric count of from 12,000 up to 25,000 and subsequently fabrics for both clothing and home furnishings. The above data are given in good faith and refer to values obtained from samples of current productions. We reserve the right to modify the technical characteristics or update the data without notice following developments in technology and/or our experience.